First light from the Leica M9 was inauspicious… Though this was not the cameras fault. I had picked up a Voigtlander Nokton 50mm f/1.1 and was having a horrible time trying to get focused images. As I struggled to figure out what was going on, I naturally assumed that somehow my eyes had aged over the past 20 years and focusing was less precise than when a Leica M6 graced my hands back in college. I loved that M6 and the 50mm f/1.4 Summilux lens that went with it as focusing was precise and fast, and it was a mistake to sell it. However, tuition had to be paid and that was one of several items that went to cover the bills. Yet, after having shot with that M6 years before, there was something about that experience that still tugged at the photographer strings in me. 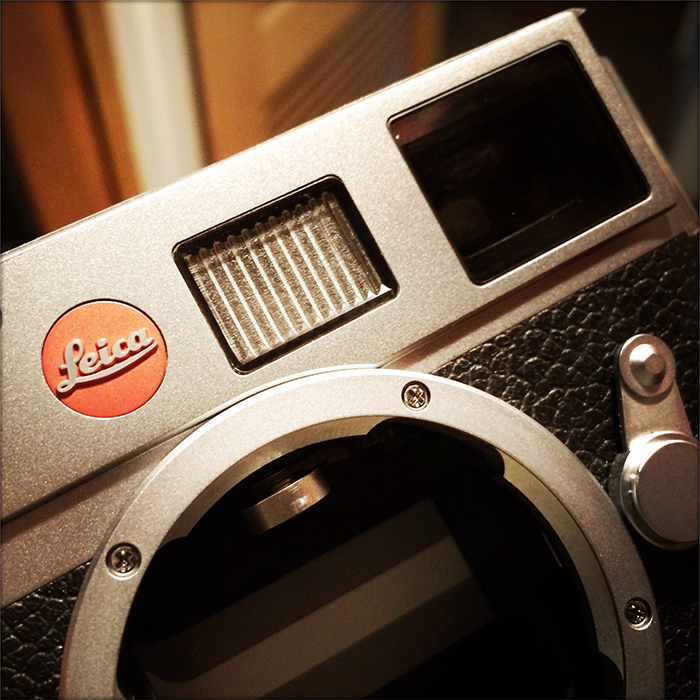 When a Leica system is right, it is comfortable and just so right. In many ways, buying the Fuji X-Pro1 was the answer to that paean for my long lost Leica M6 and I’ve been very happy with it. Sure, there is always going to be a market that can afford the Leica, but my central question in going back to the Leica is: is the Leica experience and image quality worth it? There are clearly some issues of Leica ownership that are more complicated than owning Canon, Nikon or Fuji gear. Aside from the astronomical price of the body and lenses, service is awkward and expensive. One of the things I was entertaining with these focus issues was having to send the Leica in for service to make sure the focus prisms were calibrated. Though I never had to calibrate my old M6, this is apparently an issue with the Leicas and often means sending the cameras to a central service center in New Jersey or in Wetzlar, Germany. Your average camera shop, even the Leica approved distributors are not allowed to do these kinds of adjustments. As you can imagine, this takes time and… money. I was told that calibrating a Leica lens can run $350, a process and price that seems outrageous to me after having shot with Canon gear for 20 years and Fuji for the last year and a half. Perhaps its like owning a Porsche vs. a Toyota… We’ll see. First impressions are always part of the calculation of “worth” and both Fuji and Leica understand this with respect to packaging. Both the Leica M9 and the Fuji X-Pro1 are beautifully packaged. In fact, I’d say that the Fuji has better packaging with nicer materials, magnetic clasps, and a better sequential experience in unboxing than the Leica does. Once out of the box, there are some immediate perceived advantages with the Leica M9 over the Fuji X-Pro1. First up is holding the Leica. The M9 is thicker than I remember the M6 being but there is a solid feel to the Leica that the Fuji X-Pro1 just seems to miss out on. Though both cameras need an ergonomic addition in my opinion that is nicely fulfilled by the folks from Match Technical with their Thumbs Up. It is interesting that the Fuji X-Pro1 almost “feels” closer in size to what I remember the old film based M6 being. As to the actual controls, as nice as the Fuji X-Pro1 is, the switches and controls have a more solid and robust feel on the Leica. That is not to say that the Fuji X-Pro1 is not well built, because it is. For example: Last trip to London, I dropped the Fuji X-Pro1 from my shoulder onto concrete in a crash that made every photographer in the room (David Hobby, Zack Arias, Joe McNally, Greg Heisler and Keitaro So) cringe with the knowledge that I’d just done something truly bad. Turns out, everything was totally fine and I shot this image of Keitaro So immediately after. So, the Fuji cameras are rugged, the controls just don’t *feel* as solid as the Leica ones do. The Leica M9-P is certainly a bit heavier than the Fuji X-Pro1 and that may contribute towards some of the feeling of solidity, but weight is the enemy as far as I am concerned and why I started carrying lighter weight cameras more often as of late. Though I find the Leica M9 pleasantly solid and the weight is just about right. Finding the right balance between heft for handling and lightness is a challenge. The Leica M9-P also has a sapphire glass screen cover, a notable improvement over the Fuji X-Pro1 LCD cover which scratches relatively easily. Though one can buy lots of Schott glass covers to protect the Fuji for what the Leica cost differential is. It would still be nice to have a better LCD glass like the Leica M9 or what Fuji has done with the X-T1, though the LCD itself on the Leica is atrociously bad. Probably the biggest issue found before talking about actually making images in later posts is comparing and contrasting the two cameras revealing the beautiful simplicity that the Leica M9 has over the Fuji X-Pro1. The controls are simpler and far fewer in number as are the menus on the back of the camera. It really is shocking how complex menu systems on modern digital cameras have become and picking up the Leica M9 has reminded me that camera companies need to put more effort into the design of the software interfaces that control their cameras. Honestly, Fuji is not the worst offender. The number of nested menus on my Canon gear is astonishing and Nikon is just as bad. But over the past few years, I’ve deliberately avoided Sony cameras, particularly the NEX series because of a truly horrible interface. Using this Leica for the last couple of days has shown how wonderful a simpler menu system can be, even if there are some odd implementations. The Leica immediately is intuitive and menus are not a series of nested submenus. Each thing in the menu is a function, and not an introduction to a list of sub-functions. Fuji could learn something here, if even something as simple as how battery information is displayed on the Leica. Though, once you fire the cameras up and look through the viewfinder, the Fuji shows the brilliance behind their hybrid optical viewfinder. The option of having a heads up display projected onto your optical view is wonderful, but the solution to the biggest problem of using interchangeable lenses with a rangefinder style camera is Fuji’s implementation of a slide in electronic viewfinder. This was a revolution when the Fuji X-Pro1 came out in 2012 and here, two years later, its still a better solution than Leica has. By far. The Leica also has slower processors on board making for more deliberate image processing and reviewing and you can only use SDHC memory cards, a frustration that occupied an hour or so of my time until I got the manual back out. There is a history of finicky SD card support with the Leica and what I did not realize was that the SDXC cards I was trying to format with it are entirely unsupported. This is still true with the current Leica ME model, though the new Leica M240 supports SDXC cards now. I’ll refrain from discussing image files or quality or aspects of the optics in this post as I’ve not really been able to get a reliable series of images from the Leica yet. Early indications are that there is something magical about the Leica images I’ve had that were in focus. Like the Fuji X-Pro1, there is no aliasing filter on the sensor and the Voigtlander lens that is currently on it can be incredibly sharp, its just that few of the images are in focus where I want them to be in focus. Look for discussion and comparison of images in future posts after the lens issue gets sorted. 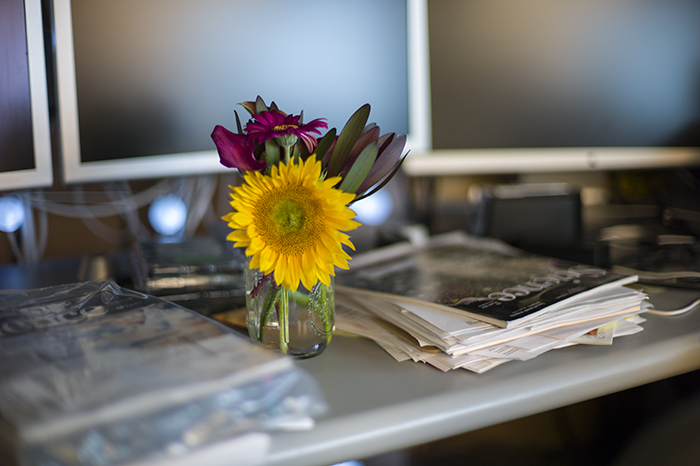 For now, you can download a full size image of the flowers on my desk to look at here. I had focused precisely upon the flower, but as you see, the plane of focus was significantly behind the flower. If however, you look at the plane of focus on the mason jar, note that the Voigtlander 50mm f/1.1 wide open is pleasantly sharp, particularly for an aperture this wide. I’ll look forward to getting this lens fixed ASAP and get back to exploring images made with it. Update: 03/03/16 The Leica Experiment. Ha! Ruben my friend, what are you, some kind of comedian? Hey Bryan, great post. I will be watching to see what your thoughts are on the M9. If your interested in looking at the M240 for comparison let me know. I picked one up last month and have been very impressed so far. Oh, wow. Which lenses do you have for the M240? Niiiiice. Great lens, awesome shots. I guess your reply is already in the article. You cannot get a sharp image with your Leica and to get one, you have to consider SAV. This does not make sense. The result counts, but you cannot get them.. One nice image, but you admit that the focus plane is not where you wanted it to be! Fuji is winning this war hands down and their market share keeps increasing where most others see net reductions all the time. The reason? They keep their promises, listen to customers and produce great glass and bodies at competitive prices. And the images are fabulous! Let me be clear. The problem was a faulty lens on the Leica. Switching the lens out gives sharp results that are… stunning. Almost 3D. 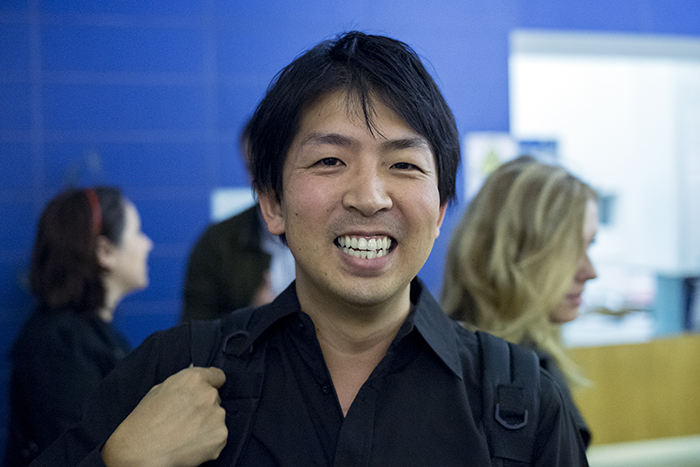 As to Fuji, I think you’ll be hard pressed to find a more satisfied Fuji customer in me. I think Fuji has done what no other camera company has been able to do and have showed the rest of the global market the way forward. I love my Fuji gear. This is simply an exercise to give a fair, unbiased comparison between the Leica and the Fuji cameras. As a first wave X-Pro1 adopter, I’m not owning a Leica myself, but have a few friends that made the switch to Leica M9 & M240 at some point in time. This gave me the opportunity to perform a few comparisons between both systems. Both cameras share one common principle… they allow you to work very ‘invisible’. More than a DSLR, but I could say that a good photographer can also deal with this problem to ‘disappear in the background’, even if he would use a MF-camera ;-). Fuji is nowhere in built quality where Leica is. The plastics used in this camera – including for the LCD-protector screen – are not very resistive, nowhere where DSLRs are. The paint is delicate, gets damaged extremely easy. My camera looks after 2 years very ‘used’ while I cared for it very well. Also the lenses are from a mechanical point of view much cheaper stuff than most think. I’d problems with quite a few of them, there is a lot of plastic in the innards. Contrary to Leica, which is built like a tank, all metal, it can survive any war. The X-Pro1 has AF. Yes. But one of the most unpredictable systems I’ve ever seen on a camera. Low light behavior is even below par of quite a few cheap compacts… Leica is manual, but working with a RF is a kind of methodology that you need to adopt. The Leica lenses allow you to focus very quickly… once the tricks unsderstood, this camera is an extremely well-shaped tool to work quickly and unadvertised. With the Fuji – even after two years – I’m still running into blocking issues – the FW is not straight forward. But to be honest, also the Leica is not perfect. Even the M.240 has weak and outdated AWB and exposure algorithms, from time to time going completely off-road. Btw… I also find the Fuji exposure algorithm not even close to what I’m used from Nikon. It’s often wrong, but it’s a lot better than what Leica is doing. The X-Pro1’s VF technology is interesting, but the OVF doesn’t provide you any info about sharpness (like a mirror and RF does) unless… of course the green focussing square. The EVF has a terrible shutter lag, making it extremely difficult to work in dynamic situations. Lenses… well Leica has its optical reputation. The Fujis are good, I must say that in one to one comparisons I was very surprised how good the Fujinon glass is performing. Not too much criticism here, unless the fact that Leica is legacy system and I doubt Fuji is. Every new lens release required a FW-update for all cameras, not so sure what that means for the future. I still think Leica glass is an investment forever, the Fujinons are stuff you’ll be wanting to replace over 3-5 years with newer and better versions. Sensors… the M9 has a full-frame CCD… I still like the CCD rendering more than CMOS but I know quite a few people will disagree. The Fuji has that weird APS/C ‘D7000’ sensor with its problematic color filter. Sometimes I like the results, sometimes I don’t. Fuji has made IMO a mistake by not going for full frame. I doubt that the XF-flange will ever have this capability and most glass will be unusable… while Leica, yes, Leica did do the job with extremely small lenses, smaller than the Fujinons. It’s a very strong discussion, but I don’t like APS/C since it doesn’t deliver you for the same focals the same shallow depth competences. Thanks for your comments, though I disagree with some of them. The Fuji autofocus for instance: Try updating to the latest firmware. I’ve been pretty happy with the autofocus performance, though its not as good as say the Fuji X-T1 which is outstanding. I also find Fuji’s AWB to be remarkably good. It may not be the value that I might have suspected, but whatever algorithm they are using works well as the color “looks good”. I’d also have to say that Fuji lenses are some of the best I’ve ever used. Incredibly sharp and I’d argue perhaps the best value for the money in the world of digital photography. Though your comment on the value of the Leica lenses is absolutely spot on. The FF vs APS-C argument is fairly moot these days, I don’t fee that FF has the huge image quality advantage over APS-C that it used to. Using a smaller chip allows Fuji to keep body prices down and allows the lenses to be smaller and less expensive as well. I think Fuji’s sales figures show that APS-C was not a mistake on their part. Also, you’ll be comparing a camera that was released 5 years ago against one that was released 2 years ago. That’s big 3 year gap in technology. CCD chips do render differently than CMOS chips, and the X-trans sensors is more different still, with their unique bayer filter arrangement, which results in stronger luminance information, but weaker color information. Really though, choosing a camera is a personal decision for the photographer. You should shoot with whatever feels comfortable to you but still delivers the level or image quality you require/expect. In the big scheme of things it doesn’t really matter which camera, lens or sensor delivers better technical performance. Very, very few modern lenses or cameras deliver images that are not acceptably sharp these days, so it’s better to chose the system that makes you comfortable and renders colors the way you like. My Fuji has the latest firmware, but even then… in good light, there is of course never an issue. But in low light and a nights cape environment, the X-Pro1 is still having a poor performance. Use a good pro DSLR and the X-Pro1 aside of each other, shooting f.i. a music performance… you’ll immediately see what I mean. Depending on the lens itself as well the X-Pro1 is maybe able to deliver 50-60% of usable material with a lot of pain and tricks, the DSLR will approach 90% or more without a flaw. For Leica, the AF is not an issue ;-) but I find it extremely difficult to use it in low light conditions. At least, that’s my opinion. Nobody will change my own opinion about shooting FF… I’ve got thousands of pictures showing how different it still is versus APS/C. But there is a fair bit of hyping around Fuji & the APS/C story that ‘it doesn’t matter that much’… well, for me it does – no way Fuji X can do the same. I agree with you in that the X-Pro1 focusing is not up to the latest DSLR performance. For instance, the Canon 1DX I have probably has the best autofocus performance of any camera system available to the general public. In low light or extremely fast motion or any where actually. That is the standard for me that everyone really should have to meet. I’m afraid, you’re likely to find that the Voigtlander Nokton is within calibration, and cannot be adjusted to get accurate focus at f/1.1, without sacrificing focus accuracy at a different aperture. I have previously owned that lens and it exhibits focus shift between f/1.1 and f/2. On film, it works better because the depth of the film itself is more forgiving of small focus errors, but on a digital rangefinder, it doesn’t work that well. All Voigtlander rangefinder lenses were designed to focus on a film plane and so, work with varying degrees of success on a digital sensor. I can handle a focus shift. The problem here is that the focal plane when the lens is in focus is very far off where the rangefinder focus box says it is. You then have to alter focus “back” and guess where the actual plane of focus is. Because of the focus shift, this is complicated and is kind of a two variable problem. If the focus of the lens can be matched to the rangefinder indicator, focal shift can be accommodated. You do realize that the new Leica M240 has focus peaking with the live view. This was more an issue with CCD vs. CMOS chips. Congrats on your acquisition, interested to see how you find the Leica. The 50 lux on my M9 is squirrely wide open but very dependable otherwise. As for the sensor—that CCD is so very old, and it leaves a lot to be desired. but if you want a full-frame digital rangefinder, it’s either the M9 or the M 240. Thanks for writing this up—you’ve inspired me to get back to writing.